Update: This Goodreads giveaway has now come to a close. Thank you to everyone who participated and congratulations to the lucky winners! When one of my longer books is released as a trade paperback, I arrange a giveaway for it on Goodreads. This helps make readers aware of the new release and generates some excitement about it. 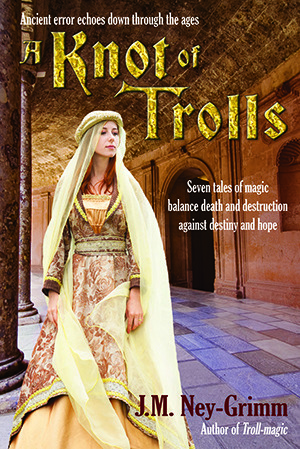 I’ll be giving away 10 copies of A Knot of Trolls, the winners to be decided in mid-May. Interested? The sign-up link is below. North-lands spellcasters who reach too boldly for power transform into trolls – grotesque villains wielding a potent magic and destined for madness. “The Troll’s Belt” stars motherless Brys Arnsson, challenged as much by his own deceit as by his troll foe. “Crossing the Naiad” presents shepherd girl Kimmer with a dangerous tragedy from the distant past. “Skies of Navarys” follows two friends with a vehement difference, their contested decision to decide the fate of thousands. In “Resonant Bronze” Paitra and his brother struggle to claim appropriate guilt – neither too much nor too little – and thereby defeat a troll warlord. “Rainbow’s Lodestone” offers the spirit of the rainbow a chance to learn that the smallest places birth freedom. “Star-drake” stalks a pitiless troll-herald to defeat – or is it victory? – utterly unforeseen. And in “Perilous Chance” young Clary needs a miracle. But her miracle – when it comes – sports razor-sharp talons, world-shaking power, and a troll-witch to guard its sleep. This entry was posted in News and tagged Goodreads giveaway by J.M. Ney-Grimm. Bookmark the permalink. Congratulations – well done. Getting books out the door, and published in all the major outlets is a great accomplishment.